"Although Chef Mark enjoys the smokey flavour of fresh smoked Ontario garlic he says roasted garlic makes a fine substitute." 1) Melt butter in heavy bottom 4 quart sauce pan. 2) Add chopped onions and chopped smoked garlic, sweat together until tender and translucent. 3) Add white wine and chicken base. 4) Add flour and cook for one minute. 5) Add cream and whisk together. 6) Cook over medium low heat whisking frequently. 7) Heat and whisk soup until small bubbles break the surface. 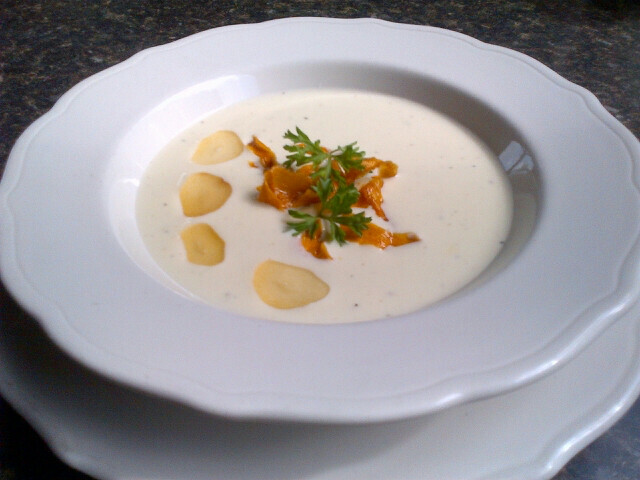 8)Turn soup off and puree with hand blender. 9) Add aged white cheddar, return to medium low heat and whisk constantly until cheese is melted and combine. 10) Strain soup twice through a fine mesh strainer for a smooth velvety texture. 11) Re-heat soup over low heat stirring constantly. 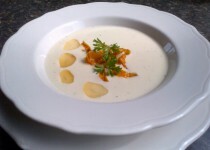 Serve in pre-warmed soup bowls and garnish with thin slices of smoked garlic, deep fried carrot crisps and fresh herbs. Chef Tips: Leftover soup can be used as a sauce on grilled salmon and makes a fantastic creamy pasta sauce.